Huge. Seriously, there’s more game in this package than is reasonable. New Hunter Styles and Hunter Arts ensure myriad fresh ways to build your character. Not an ideal starting point for fresh meat – though still better explained than most others in the series. There’s little in the way of a cohesive story to pull you along. Where to begin? That’s likely what a newcomer to Monster Hunter utters first. This is a series revered by fans for its complexity, but for those who feel the allure of the core conceit - felling mighty made-up beasties and harvesting their bits to wear as bespoke suits of armour - it too often feels front-loaded with befuddlement. Generations has a seemingly unattainable aim: to satisfy long time players and still ensure those new to the series have enough to grasp as they’re whisked away into a world of weapons, movesets, gear and, well, um…monsters. In the pursuit of that aim, Generations is a kind of greatest hits album, with just the four new main event monsters to hunt amid the now-gargantuan roster. Instead of a narrative that sees you build up a single town or caravan over the course of a steadily escalating series of quests, the adventures are spread out over four towns, three of which return from past outings. This doesn’t feel like a rehash, however, more a chance to catch up with long forgotten friends (4 Ultimate’s Guildmarm hasn’t been gone from my 3DS screen for long, but she just needs to call me ‘Doodle’ and I’m sold). For the uninitiated, Monster Hunter has always revolved around its unique underlying RPG systems, which see your custom main character grow through the active pursuit and accrual of increasingly awesome gear, rather than steadily improving stats earned through levelling up. Blacksmiths enable you to craft weapons and armour with the various chunks of monsters you bring them, and part of the fun of the hunt - aside from the fights themselves - is in figuring out which gear will help you in each scenario, and the most efficient ways of gathering the necessary resources to craft it. A full set of Tetsucabra armour, for example, will help you out with its high fire defence stats, though you’ll have to navigate said beast’s heavy-hitting rock barrages to steal enough of its hide to craft a full set. Unlike the steady flow of additional weapons accrued over previous series entries, there are no new weapon sets this time out, which feels like it might be a conscious recognition of the fact that 14 (!) is more than enough. That said, one of the major new additions to the formula more than makes up for the lack of a new set of blades to get used to: Hunter Styles. Upon character creation, and with every trip back to town, you’re able to assign your hunter with one of the four Styles, three of which significantly alter the way you play the game. Guild Style is the most familiar, and sees the control scheme remain pretty much the same as past entries, enabling the uninitiated to catch up nicely and still play their part in multiplayer sessions. Aerial Style adds a little jump into your moveset, allowing for much easier mounting of monsters (behave). With this in your locker you can leap on the back of slower foes to quickly get stab-happy, without having to look around the environment for handy crags to leap from. This, as you can probably imagine, is the most immediately fun way to play. Adept Style is the one to choose once you know what you’re doing. Dodge at the last possible second when this style is active, and boost your hunter through an enemy’s attack, leaving them open for hugely effective counters. 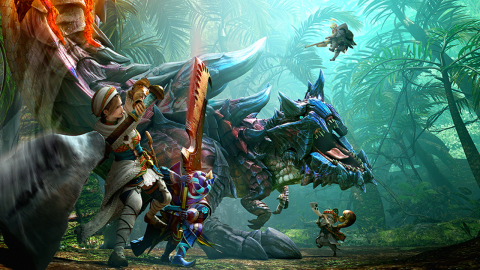 The last style, Striker, is where we have to delve into the second of the two major new additions to the Monster Hunter formula: Hunter Arts. These are equipable special moves that provide huge benefits, and there are loads. You can slot in an ability that triggers a massive, damage-unloading super strike, or one that triggers when you’re running away to allow for easier getaways and lower stamina drain. Striker Style allows a hunter to equip three of these arts, instead of just one, in exchange for a slightly curtailed standard weapon combo moveset. In short, Generations’ new combat systems are utterly transformative. In MH4U you were limited to the weapon you used as to your moveset - use a Charge Blade in MH4U, and everyone else will have the same moves. A Striker Charge Blade user and an Adept Charge Blade user in Generations, however, will each have significant additional moves which differentiates the way you play. There are simply too many options to consider beyond just your gear, meaning there’s more emphasis on the once comparatively simple act of preparing to head out on a hunt. Did you see that? I just referred to the past act of prepping for a hunt in Monster Hunter as simple! Those who’ve bounced off the series’ complexity before will probably know what this means. While Capcom has tried to make Generations easier to get into (the tutorials are as comprehensive as they’ve ever been and the new structure boils away many of the distractions from the pure hunt) this remains a difficult game to break into for first timers. It’s totally worth it, but I certainly have hardened gamer friends who’ve shied away from the game after a few sessions, readily admitting that it just wasn’t for them. There is a new element explicitly crafted to allow newer players to join in under less strenuous circumstances. Prowler mode lets you play as the perennial series mascots – Palicos. Playing as one of these feline friends strips away the stamina bar, and a number of other elements of the hunt, boiling fights down to simple bouts of attrition. I found them dull to play as because of this, and because they don’t work to introduce core tenets of the wider experience, this mode feels a touch... su-purr-fluous... Sorry. The lack of a tangible story to follow throughout the game is another disappointment. The four village structure means there are plenty of fun characters to meet (and cat puns to navigate), but I miss the steady influx of personality that came from returning to a town with a smaller group of characters over the course of one huge, arcing adventure. There’s still the steady loot loop to keep you motivated, but the cohesion of a central story has been lost. When it comes to the hunt itself, however, this is definitely up there with the best of the series. Never before have there been this many options, this many ways to play. Given its inherent complexity, there can never be a perfect game to start playing in this series. But break through Generations’ scaly exterior to the juicy combat loins within, and you’ll find more meat on more bones than ever before. Get stuck in.